We always knew the Xbox 360 failure rate was high, but the only time Microsoft's put any sort of solid numbers on the thing it was always somewhere around 5%. Retailers, on the other hand, have just reported a failure rate of somewhere over 30%. That's pretty ridonkulous. It's a good thing Microsoft support is usually pretty good about taking them back, so you don't have to go all Picard and shout about how many lights there are over the phone. From what we've seen in unconfirmed reports on the Net, the problem comes from insufficient cooling for the GPU. 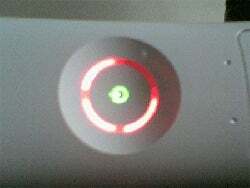 This in turn causes the three red lights, which means you're going to have to send back your 360 to Microsoft and possibly get a dirty refurbished unit in return. If you're really, really lucky (and French), you'll get a unit with added cooling as well.